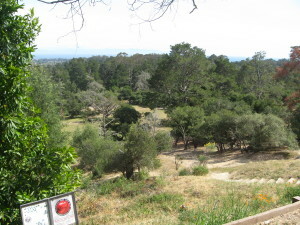 Santa Cruz has an intimate connection with the history of disc golf, not to mention a world famous course that is considered one of the most challenging in the world. Many of the earliest organizations and companies involved in the sport came from our own backyard, not to mention a few professional players and several highly ranked amateurs. Delaveaga Disc Golf Course – Delaveaga, or “Dela” to locals, is one of the most beautiful (and frustrating) courses in the world. Situated just past the golf course, it offers a similar layout and terrain, if with a bit more rugged and un-manicured. Part of the difficulty of the course is that there are endless trees on most holes, a majority of which hide the steep ravines just behind them. Each year, Delaveaga plays host to the Steady Ed Memorial Master’s Cup, which draws the top players from all over the world. 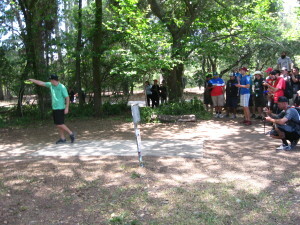 The tournament is one of the few that make up the National Tour of the Professional Disc Golf Association. Delaveaga is one of the most challenging courses in the world, so be prepared fo r some difficulty if you’re a casual player throwing a round. With 27 holes and plenty of elevation changes, it can also be pretty tiring. Make sure to bring water as there is none available at the course itself. Aptos High School – If you’re not quite ready to take on Delaveaga, Aptos High School has a wonderful 18-hole course on the perimeter of the school campus. (Important to note: the course can only be played after 3 p.m. when school is in session). A challenging, but much easier course than Dela, Aptos High School offers a lot of variety: open shots, tunnel shots, a “top-of-the-world” hole, and multiple basket placements. Black Mouse – Black Mouse Disc Golf Course is actually located in nearby Felton, just behind San Lorenzo Valley middle school. As with Aptos High School, the course should only be played after 3 p.m. when school is in session. It’s a relatively short course, but it is heavily wooded and the entire thing is on a sloped hillside. Your disc will get familiar with plenty of trees when you play this course and you may also witness the worst rollaway you’ve ever seen (outside of Dela, of course). It’s a challenging and technical 18-hole course that is heavily shaded, which is a nice break from the sub-baked rounds offered by other local courses. UC Santa Cruz – UC Santa Cruz has recently installed a 9-hole course that is pretty straightforward and definitely the easiest one on this list. Some of the holes require a bit of distance, especially if you’re throwing from the long position, but all are wide open and offer at least a look at the basket. There’s a little bit of elevation change, but not much in the way of obstacles (see here for map). Golf can be one of the amazing outdoor activities Santa Cruz has to offer not only to those, who life in the city, but also to Santa Cruz visitors.